Hi There! Welcome to The Mom’s World! I'm Priya, a self-motivated woman from Chennai, the buzzing capital of Tamil Nadu, joined my hands with God chosen Soul Mate Arun on April 6th 2009. Blessed mother of two little ones – Daniel 5-years-old, born as a Prince to us on Feb 13th 2010, Christina 1-year-old born as an angel to our family on a very special day, Jan 18th 2014 and that’s my sweet family. I have completed my degree in Electronics and Communication Engineering from Sree Sastha Institute of Technology, Chennai, affiliated to Madras University. I have five years of experience in BPO industry, of which four years and six months I worked in HCL. I gave up my job to take care of my sweet family and I’m happy. I love being with my little ones always, I care, plan, think so much for them, and that fills my everyday calendar. 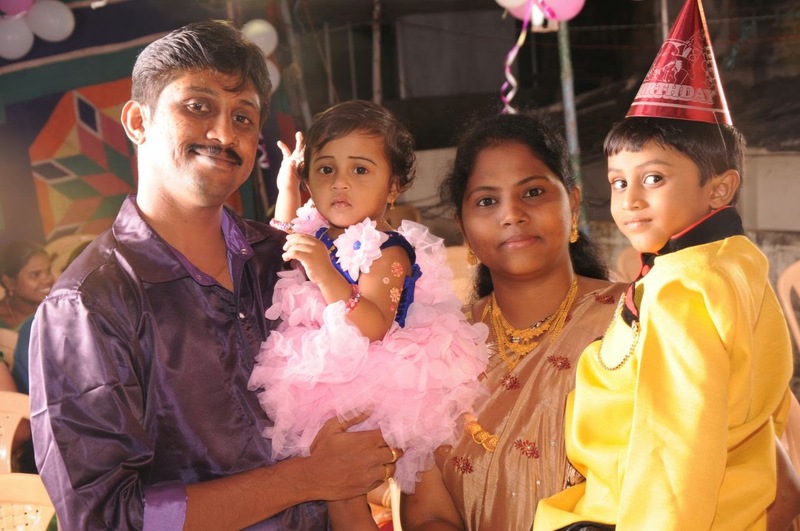 My brother Sarav, a creative blogger writing under the pen name “Someone is Special” at “Few Miles”, and his wife Vidhya blogging at “Vinayaka's Kitchen”, after seeing my passion towards my little ones suggested me to create a Lifestyle and Parenting Blog to share useful information for Young Mothers and that's how "The Mom's World" blog came to the world. I am happy to launch the site on Dany's birthday. He is really a special person in my life and I am dedicating this post to him. My next post is on Dany, where I'll be telling about his likes, dislikes, habits, etc. Thank you for visiting The Mom’s World. Please come back for more. I will be writing regularly on Mondays. You can add me on Facebook, connect with me on Google+, and subscribe to my Feeds to get notifications of our latest tips. Welcome to Blogging World! My hearty congratulations to you sis. By the way nice intro and lovely family pic. Welcome to Blog-o-sphere! Have a wonderful time scribbling your experiences here. Looking forward to the same. I heartily welcome you to Blogging. ''Parenting'', has always been one among my favorite topics. I usually ponder on how it really should be done. Reading you will surely help me to have a better idea of upbringing and child's psychology. Dany and Christina, both are adorable! And you've a beautiful family. Thank u Vidhya, Sarav and Simran for ur wishes and support.